I’m planning a workbench project to replace the workbench-shaped object that graces my shop. It’s crooked, too light and has vises that don’t vise. And it’s a topic for another day. 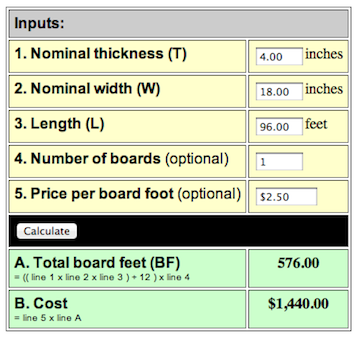 Being lazy I googled “board foot calculators”. Top of the list is the Board Foot Calculator from the University of Missouri. I plug in 4″ thick by 18″ wide by 96″ long, and $2.50 per board foot. OK, I need 576 board feel and $1,440. WHAT? If you navigate up a level from that page you’ll see that they have a very nice page on the Measurements and Pricing of Primary Wood Materials where they explain that board feet are calculated as (length * width * thickness) / 12. Not likely. The third entry on the google results page is another calculator from Sawdust and Shavings. They explain, correctly, that board feet is a volumetric measure. One board foot = 144 cubic inches. They even give the correct formula, then proceeds to calculate it incorrectly. So the top two sites as ranked by google provide the wrong answer. Must be the new math. In truth there are 48 board feet of lumber in the finished bench top (18″ x 4″ x 96″), and I’ll probably shorten it to just 6′. Would it be wrong to buy myself an early Christmas present?